Start getting excited because the red, white and blue flags are flying and the air is filled with the smell of fresh barbeque. Independence Day is right around the corner! If you’re like us and you’re looking forward to the many great activities, parades and mind-blowing firework displays, join us as we share some of our top 4th of July Events near Dripping Springs and the Austin area. 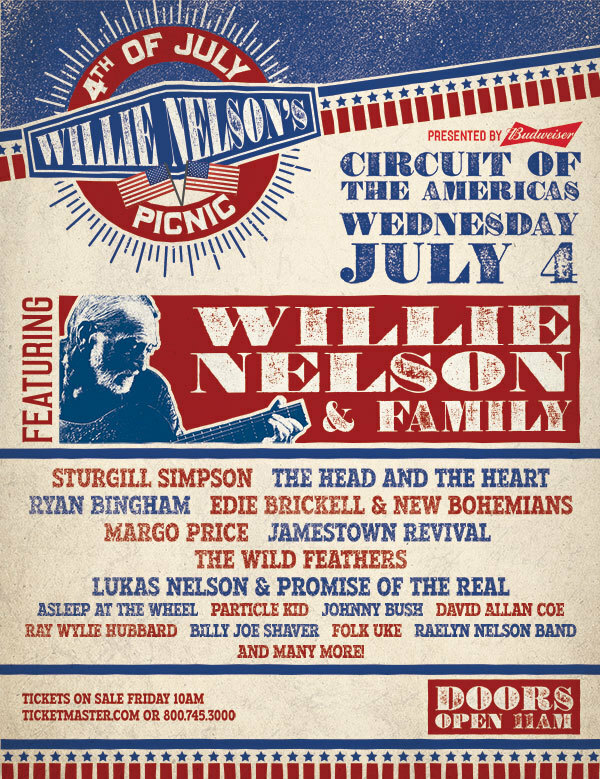 Our top recommendation for 4th of July events near Austin is the Willie Nelson picnic. Join legendary music artist and guitarist Willie Nelson for a day of your favorite country music live at Austin 360 Amphitheater at the Circuit of the Americas. Willie will be joined by many of his star-studded friends, such as country artists Sturgill Simpson, The Head and The Heart, Ryan Bingham and many more. At sunset, end the day with a firework show accompanied by Willie himself playing some of your patriotic favorites! Tickets for the event will be available from Austin360 Amphitheater. Doors open at 11 a.m. while the show starts at noon. If you’re searching for 4th of July events near Dripping Springs, look no further than Fire in the Sky at Ranch Park. The annual Fire in the Sky event is one of the best opportunities to see fireworks in Dripping Springs. Spend the day enjoying good barbecue, live music, local beverages and more with your friends and family. Then to wrap up the night, stay through dusk for the Fire in the Sky fireworks show. Our last 4th of July event near Dripping Springs you’ll want to be on the lookout for is the Fredericksburg Heritage Festival. The Fredericksburg Heritage Festival is a classic Texas 4th of July experience featuring an early morning Children’s Parade at Marktplatz, followed by parties and an aircraft flyover signaling the beginning of their Main Street parade. After the parade, join the rest of the town at Becker Vineyards from 10 a.m. to 6 p.m. for the best chili cookoff, food and drinks that the Hill Country has to offer. Once the cookoff comes to a close, head to Lady Bird Johnson Municipal Park for the City of Fredericksburg Fireworks Display, beginning after sunset. Caliterra wishes you a safe and fun Independence Day and hopes you’ll be able to celebrate at one of these amazing events around Dripping Springs. Do you already know which one you’ll be attending? Connect with Caliterra on Facebook, Instagram or Twitter and let us know!